Thanks very much to Mohamed Amin for the above link. It is an older Al Ahram article. What about the Egyptian value for the Golden Ratio Phi? In an article I have posted on line titled "The GreatPyramid Architect had a Secret" there is a Phi value that is in agreement with Assem Deif's article on all the Great pyramid's measures, with the exception that my article provides a value for Phi that answers your question about a value for Phi. I hope you will take a look at it and/or pass it along to Professor Deif. 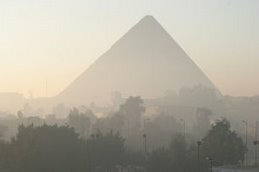 I would like you to explore my blog on some new theories about the Great Pyramid.